Discussion in 'Tutorials, Tips and Tricks' started by Draven_Luv, Nov 5, 2015. As a moderator I have noticed many people asking about how just the new voting is working and everything that goes along with it. To make it easy on answering this question for myself, and hopefully for others that get asked, I thought to make a short forum post. I hope this helps and you guys will understand it a bit better. Of course! Click on Me to be able to vote! Remember, you can only vote once per website, per every 24hrs. Now, instead of doing /vote redeem, the way to redeem your votes, or now the so called tokens is through /shop command. To see that you can type in /vote show. A message should pop up letting you know how many tokens you've got left. Alternately, there's a message that pop's up ever so often letting you know "you still have (this many) tokens left, please redeem them". If your tokens have not been given to your account wait before making a ticket or a post! There's something in game that you can do! If they still do not show up you can type /vote forceupdate - this command forces the "initiation of vote to token conversion"
If it is how it looks, simply click on the emerald to be able to switch over to tokens. Of course hovering over those icons will let you know what's what as well. Each time you click on the item you get a message in chat letting you know to type out the amount of tokens you want to be used up. You can redeem anything from below the number of tokens, to the exact number of tokens you've got. If you press F9 button twice a green grid will pop up for you. This grid outlines where each chunk is. 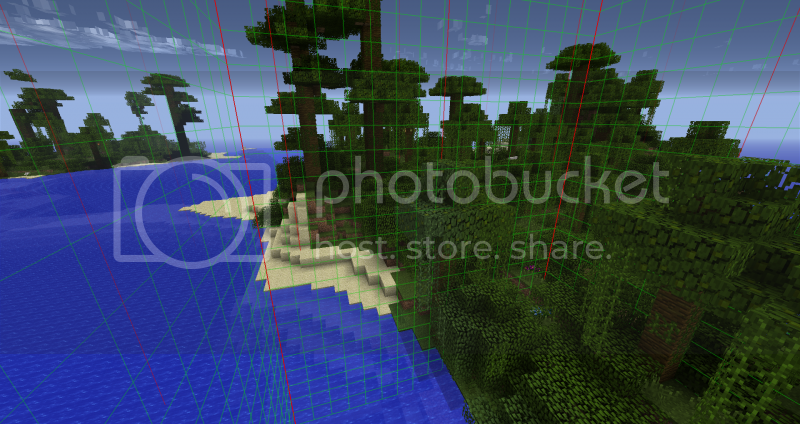 One of these chunks is 16 x 16 blocks. To make the chunk loader work you must redeem some tokens into tickets. The tickets are a crucial part for the chunk loaders as they are what is used to keep the loaders running. Make an iron block and place it in the area where you wish to have it be loaded while you're online. Of course, as mentioned before, when you hover over these options these descriptions are available there too. Click on the dye for whichever one you want to use. Keep in mind these chunks are connected to one another. You're done! You can now go back to doing what you were. Also, one way to tell if the chunk loader is working...If you have particles enabled the chunk loader will spew out black puffs from time to time. Reminder: This loader is available to donators only! You're done! You can now log-off while your machines work throughout your absence on the server. OoGhostlyoO, doke_, The42ndDruid and 18 others like this. I'm literally doing everything, i shifted right clicked the block of iron, the menu never pops up. Are you sure you're doing so with an empty hand? @Founder could you create a mym.li/tokens link to this thread that we can post in chat when someone asks for info about it, and also perhaps have that link as a <tip> triggered when a player says "vote redeem" in chat? I was on IE1 for about 12 hours yesterday, and I must have had to explain about the new system about once every 10-15 minutes the entire time I was on! elemage and Draven_Luv like this. JacaRoe, Draven_Luv and chaosblad3 like this. Fixed up the formatting and made it a bit more clear. Also thank you, @Slind for making a short link to this page! Woah, voting has changed alot. Claims existing prior to this change are intact, correct? If you run out of tickets, do chunks stop loading? I think I know the answer to all of these but I'd rather clarify here then in-game. Should probably add how to see chunk boundaries (press F9 twice then a third time to hide them again) to the chunk loader section, some people think that chunk loaders are the center of the chunk loaded, not that it loads the particular chunk it happens to be in. I really appreciate the work that went into this thread! Thanks Draven! Thank you, @Draven_Luv for taking the time to write this!